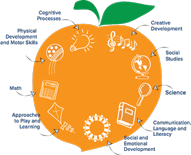 Bright from the Start: Georgia Department of Early Care and Learning is pleased to offer a variety of supplemental resources to support early learning programs in implementing the GELDS. The resources are available at no cost; however, customers will be responsible for fulfillment and shipping charges. Click the link below to visit the e-store. RR Donnelley manages the e-store, fulfills and ships orders for DECAL. Please note that the e-store site is NOT compatible with mobile devices. First time visitors to the e-store must create an account in order to explore the available resources. There is no charge to create an account. School readiness development from birth by National Center for Infants, Toddlers, and Families.